It sounds like something out of a fairy-tale: the big bad predator lures its gullible prey by mimicking a loved one: ‘why grandma, what big teeth you have!’ But in this case it’s the shocking strategy of one little-known jungle feline. 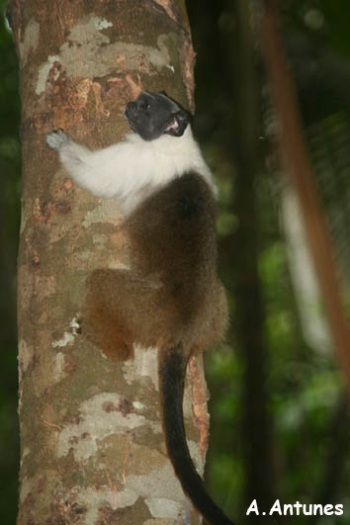 In 2005 researchers with the Wildlife Conservation Society (WCS) were watching a group of eight pied tamarins ( Saguinus bicolor), squirrel-sized monkeys, feeding on a ficus tree in the Reserva Florestal Adolpho Ducke in Brazil. They then heard the sound of tamarin babies, but were surprised to see that the sound was not coming from young tamarins, but a hungry margay (Leopardus wiedii), a small cat native to Central and South America, which was hidden from the tamarins. Attracted to the margay’s mimicry, the on-guard tamarin climbed down to investigate the sounds rather than run-away. Four other of the tamarins followed. The margay then moved toward the small monkeys. The tamarins saw the margay before it could get close enough for an attack and escaped, this time, with their lives. A pied tamarin. Photo by: A. Antunes. While there have been reports of other American cat species, such as pumas and jaguars, mimicking prey sounds in order to draw them close, this is the first time that researchers have confirmed a feline species in the Americas uses mimicry to draw its victims near. Given the margay’s low density and nocturnal habits, their have been no studies on its hunting strategy. Perhaps, this new finding will change that. “Cats are known for their physical agility, but this vocal manipulation of prey species indicates a psychological cunning which merits further study,” says WCS researcher Fabio Rohe. WCS is currently monitoring populations of the pied tamarin, listed as Endangered by the IUCN Red List. The margay is listed as Near Threatened due to habitat loss throughout its wide range. CITATION: : Fabiano de Oliveira Calleia; Fabio Rohe; and Marcelo Gordo. Hunting Strategy of the Margay (Leopardus Weidii) to Attract the Wild Pied Tamarin (Saguinus bicolor). Neotropical Primates. 16 (1). June 2009. The wild margay is nocturnal. Photo by: Tófoli/Rohe. Close-up of a margay in Belize. Photo by: Rhett A. Butler. (08/05/2008) While often over-shadowed by their larger and better-known relatives like lions, tigers, leopards, and jaguars, small cats are important indicators of the health of an ecosystem, says a leading small cat expert who uses camera traps extensively to document and monitor mammals in the wild. Dr Jim Sanderson, a scientist with the Small Cat Conservation Alliance and Conservation International, is working to save some of the world’s rarest cats, including the Andean cat and Guigna of South America and the bay, flat-headed, and marbled cats of Southeast Asia. In the process Sanderson has captured on film some of the planet’s least seen animals, including some species that have never before been photographed. He has also found that despite widespread criticism, some corporate entities are effectively protecting remote wilderness areas. (02/18/2010) Using camera traps over a two year period wildlife biologist Kashmira Kakati has discovered seven species of wild cats living in the same forest: the Jeypore-Dehing lowland forests in the northeastern Indian state of Assam. Yet the cat-crazy ecosystem is currently threatened by deforestation, unsustainable extractive industries, including crude oil and coal, and big hydroelectric projects. Some of the cats are also imperiled by poachers. In light of this discovery, conservationists are calling on the Indian government to protect the vulnerable forest system. (02/10/2010) Carnivore researchers have captured the first footage of the Sunda clouded leopard (Neofelis diardi) in Malaysia. The island’s largest predator was only proclaimed a unique species in 2006 when genetic evidence and analysis of its markings proved it was distinct enough from its mainland relative—the clouded leopard (Neofelis nebulosa)—to be considered a new species. The recent classification has prompted renewed interest in this elusive and threatened cat. (11/05/2009) Rare, elusive, and endangered by habitat loss, the bay cat is one of the world’s least studied wild cats. Several specimens of the cat were collected in the 19th and 20th Century, but a living cat wasn’t even photographed until 1998. 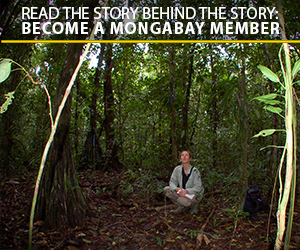 Now, researchers in Sabah, Malaysian Borneo, have managed to capture the first film of the bay cat (Catopuma badia). Lasting seven seconds, the video shows the distinctly reddish-brown cat in its habitat.